GET R30 FREE BONUS POINTS JUST FOR SIGNING UP! View receipts, receive information about promotions and special offers, and provide feedback, all from your mobile device! 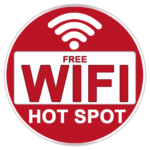 To get started, you can EITHER visit us and use our FREE WiFi to download the app and let our friendly staff assist you through the process, OR download it now by following the simple 2-step process below. If you are already part of our loyalty programme, but have not installed the app yet, you will still receive R30 just for downloading & installing the app on your smartphone. If you get a message saying Loyalty Ocean would like to send you notification – select yes to Allow. You will need to enter your email address and a password to complete the registration. Remember to check your email and confirm your registration by clicking on the link in the email. You should receive a Congratulations Message after successful activation. Open Loyalty Ocean on your smartphone and click on the SCAN button at the lower right-hand corner. Point your camera to our QR code below to add us to your places. You will see our Welcome screen where you can keep track of your points earned and number of visits to our car wash. Don’t forget, you will receive R30 bonus points just for signing up, redeemable immediately. It’s that simple! Please note, points are not redeemable for cash.